We hope our readers will use these links to make their own Thanksgiving experience more meaningful, and hopefully to share with others the truth about who turkeys could be to us, if we would only open our hearts to them: Friends to be thankful for. As a vegan, it’s hard not to feel heavy-hearted around Thanksgiving time. While the rest of the country looks forward in eager anticipation to a day of feast and celebration, we vegans tend to be seen as a thorn in the side of the collective consciousness. Some of us try and simply avoid thinking about the impending massacre, preferring to ignore it altogether, and some use the date as an opportunity to try and shine a little light on the reality of what Thanksgiving means for those whose bodies are to become centerpieces on the tables of over 45 million American homes. 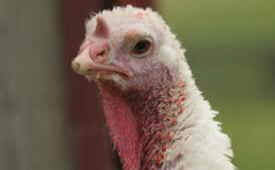 Despite their reputation, anyone familiar with animal sanctuary operations can confirm that turkeys are intelligent, social beings who nurture and protect their young and thrive in their natural habitat. Even when they are stressed and confined in concentration camps (whether “free-range” or otherwise), they have an amazing will to live, as do all sentient beings. Following is a collection of some of our favorite Thanksgiving links. 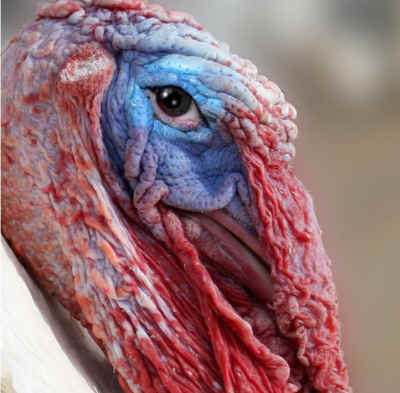 Some are from Peaceful Prairie Sanctuary, where turkeys are celebrated as the unique individuals that they are, and some are from our own collection. We hope our readers will use them to make their own Thanksgiving experience more meaningful, and hopefully to share with others the truth about who turkeys could be to us, if we would only open our hearts to them: Friends to be thankful for. Increasingly, as consumers are becoming more aware of the extreme cruelty of animal farming, free-range, organic and ‘natural’ animal products are gaining popularity. What many people don’t realize, however, is that animals raised under these labels frequently suffer through much of the same torment as those in standard factory farming operations. Melvin has been strutting up and down the hallway since dawn… After a while, he turns around slowly, laboriously, toilsomely, and drags himself back to the kitchen, heaving, and wheezing and staggering on gouty legs, then embarks again on the arduous, 20 step trek to the front door, parading in full celebration gear, big as a carnival float and as jubilantly bedecked as one… It’s Sunday. At least that’s what our calendars say – Sunday, the cusp of a new week – but, to Melvin, in Melvin’s sense of time, it’s something else, something brighter and luckier. Melvin and I have much to be thankful for. I for one am thankful for Melvin’s presence next to me today, for his life, for this moment of connection we are sharing under the wide open sky. And for the luminous memory of his five brothers: George, Stanley, Alfred, Elmer and Archie… As a group, they were a slow motion parade – an extravagant display of panache, moxie, charisma, flamboyance, and supreme self-confidence. Not a group of mere mortals to know and love, but a magnificent cavalcade of richly feathered tails, quivering wings, shifting color, triumphant song and vibrant dance to experience and be awed by. And as vegans around the world can attest to, there’s no reason that holiday meals can’t be ‘veganized’ and transformed into a true celebration of peace and gratitude, as we replace the traditional fare with clean, wholesome foods that are animal-free and incredibly delicious. For a truly delicious vegan Thanksgiving meal, it’s easy to replicate traditional dishes. There’s also great enjoyment to be found in incorporating non-traditional, festive holiday recipes to add some originality to the Thanksgiving table… Many people know that it’s now possible to buy a ready-made vegan substitute to imitate the traditional Thanksgiving turkey. But with a little imagination, there are many other ways to leave the turkey alone, and create a delicious centerpiece using fresh, seasonal ingredients. There’s no reason that holiday meals have to resemble the old traditions that center around practices many of us consider quite barbaric. This holiday, why not dress up your table with some festive delights that have nothing to do with the traditional menu? As long as the foods are beautiful and delicious, who’s to say what a holiday table should contain? When a vegan is willing to take the time and effort to help their family and loved ones incorporate delicious vegan food into the menu, and non-vegans are open-minded and even enthusiastic about trying something new, everyone can enjoy a magnificent, cruelty-free meal, and ‘veganism’ can actually become a part of the celebration.